The title of this post is the same as the title of this article on getwestLondon. The article states that advantages of restoring a full Tube service include. Better Tube service for local residents and business. Provide a step-free station for everybody. But this paragraph is surely the most relevant. Footfall at Olympia London has risen from 700,000 to 1.6m since 2011 (when the full Tube service was removed), and is likely to increase over the coming years. Only by having a full Tube service can local transport options meet this increasing demand. The more the footfall increases, the greater the need for a full Tube service. The Wikipedia entry for Kensington(Olympia) station, has a section detailing the District Line Service. The District line shuttle to Earl’s Court and High Street Kensington runs at weekends and a very limited service also operates during the early morning and evening each weekday. There is no service New Year’s Eve or New Year’s Day when these days fall on or partly on a weekend. Prior to 2011, it was much more frequent. The Wikipedia entry for Kensington (Olympia) station, has a section detailing the West London Line Service. 4 northbound to Willesden Junction, of which 2 continue to Stratford during the off-peak and all 4 during the peak. 4 southbound to Clapham Junction. Southern operate between Milton Keynes Central and East Croydon, typically once an hour. London Overground have plans to increase their service by two trains per hour, starting in 2018. 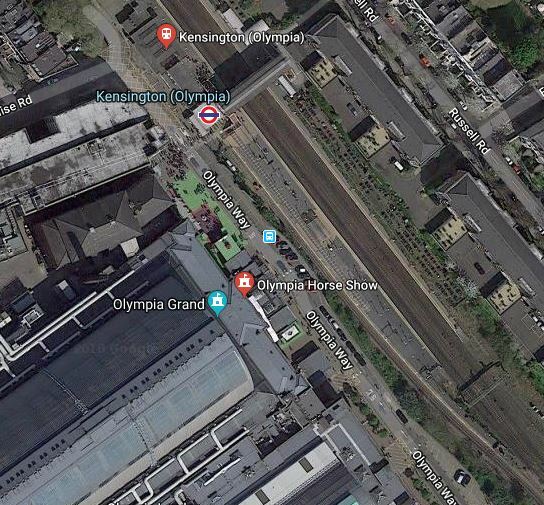 This Google Map shows the track and platform layout at Kensington (Olympia) station. Platforms are as follows from West to East. Note the footbridge linking the island platform 1 and 2, with the other platform 3. It is not step-free, which means that platforms 1 and 2 have step-free access to Olympia, but platform 3 does not. Surely, whatever happens to the train service, this bridge must be replaced with one that is step-free. It’s easy for me to get to Kensington (Olympia) station, as I just walk to Dalston Kingsland station and get a direct train. But what fastest routes do you use from these major Underground stations? Paddington – Change at High Street Kensington to a bus. These routes all used Transport for London’s journey planner. For some less important stations, you can get some complicated routes. Marylebone is a classic, which involves two walks, two buses and the Circle Line. For those, who went to Olympia before 2011, when there was a shuttle from Earl’s Court, will find they will need to change at West Brompton to get from Earl’s Court to Kensington (Olympia). Wikipedia describes the pre-2011 service like this. For a period before December 2011 the District line had an irregular short shuttle service of two or three trains per hour to High Street Kensington via Earl’s Court. One late evening train ran daily to Upminster. To be charitable, you would say it is not a passenger-friendly system for most going to Olympia. The petitioners would appear to have a very valid point.